It is so hard to finally make the decision to part with one of our adult dogs. They're so special to us and so much a part of our family and lives. 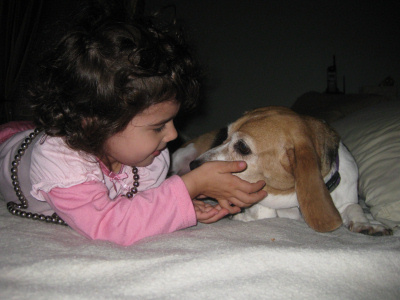 One thing that makes saying "So long," not "Good bye"a little easier is knowing that we put just as much care into placing our adoptive beagles as we do our puppies. 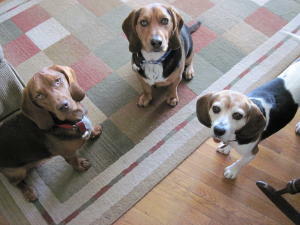 Usually our dogs are placed with families that are already part of the NJ Beagles community. It's special for all of us, but most for me as I can keep in touch with the family and get updates of the dog. 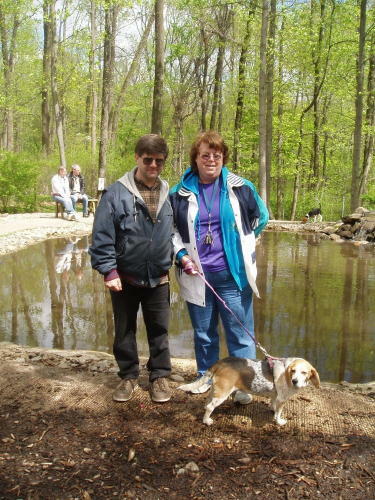 I have to thank every single family who has adopted one of our adult beagles for staying in touch with me through photos and email, or even visiting us or participating in our beagle reunions, thus allowing me to still stay involved in their dogs life. You'll never know how happy you have made me. Some people say to me, "Terry, I don't know how you are able to part with your puppies." I say to them, "It's my adult dogs I have trouble letting go. These are the dogs that I've shared so much of my life with, and although my heart is breaking when they leave, I know deep down they will always be a part of New Jersey Beagles, no matter where they live. Thank you to those of you who have taken one of our wonderful dogs and made them truly a part of your family. We just wanted to write as follow-up and tell you what a positive experience it has been to adopt one of your adult dogs, Jake. As a retired stud dog from your NJ Beagle kennel, we like to kid with him and tell him that his best years are behind him. Jake is really a great house dog! When indoors, he is so calm, patient and is such a gentleman. He just wants to curl up next to us waiting for the next hug and kisses and always is in the same room as we are. He can sit in our laps for hours while partaking in his favorite activity – big belly rubs. When we go for walks or go to the dog park, he turns into such a little beagle and appropriately so - full of energy, taking in all the smells with nose to the ground, runs around and is curious and inquisitive about all of his surroundings. He loves to smell squirrels, but he goes crazy over smells from chipmunks... which he gets when we visit friends/family in the suburbs or parks out in the country. As we live in ‘the big city’ there aren’t that many scents for him to track. He is especially well behaved in the dog park. He interacts and socializes with the other dogs, but always remains a gentleman. We love to go to the outdoor cafes for lunch and dinner and he goes right along with us and curls up under the table and waits patiently. Of course, he gets served a bowl of water before the humans get water – seems to be a norm here in Philly. Everybody in the neighborhood knows Jake (many don’t know us but they know him) and have affectionately named him ‘Prince Jake of Rittenhouse’. We must admit, we were wondering how it would be for a dog who has always lived in an outdoor kennel to adapt to house living and how long it would take for the adjustment. We thought we may be facing many months to years… we just didn’t know. But, it was instantaneous. He is the smartest little guy and learns very quickly. From the day we brought him home, he knew to go outdoors to eliminate... of course, we encouraged that by taking him out frequently the first several weeks. We worked with him on learning commands and still practice these daily even after 4+ months of him being with us. He has learned the commands of: sit, down, off, stay and 'easy' when starting to tug at the leash. He understands 'are you hungry, do you want your food', 'would you like a treat?, ‘let’s go to bed', and 'want to go for a walk' and more. The tail starts wagging and he gets very excited except when hearing ‘let’s go to bed’... then he heads upstairs and jumps into the bed. He is more motivated by praise than food treats. He is apprehensive about being in a cage. He will sit in his cage and sleep in his cage when the door is open, but shut the door and it is almost as if he becomes claustrophobic (I can appreciate this as I too can get claustrophobic!). He starts to pant and lick the side of the cage - but he doesn't bark. Initially, he would whine and rubbed a few raw spots on his nose... but with time this has improved greatly and we are confident he will continue to improve. We started with desensitizing him to the cage 5 minutes at the time. Now we are up to 2.5 hours and in our case, as retirees, will never have to do more than this. Within a few months, we feel he will be fine alone in the house without being caged. We went the cage route for his safety. We did not want him to get into anything that could potentially hurt him while we were gone. After hearing from other beagle owners and some on your NJB forum - many beagles seem to be like this and not want to be left alone. They truly are pack animals and that is part of their charm. Have to give you a compliment Terry in that Jake has seen three different veterinarians (although in the same practice) and they have all said the same thing: That he is so well socialized, loving to people, and so sweet, etc., that they are surprised he was in a kennel. They’ve said the breeder must have shown him a great deal of love and spent a lot of time with him showing him affection and socializing him... we say yes, that is Terry and how she treats her beagles. We have only had this one experience with adult dog adoption - but it has been a great one. Jake is the most special, wonderful and fun little guy - he is truly a joy to be with. As you know, we were in line for a puppy at NJB, but when we saw Jake's picture on your website as available for adoption, we fell in love. As an adult dog, we didn't have to go through ‘the puppy stuff’ - which we were fully prepared to do. Instead we got a perfect dog ready to go, if you will. Can you tell we are totally smitten with the Prince? All we can say is that we are very fortunate to have wandered onto your NJB website strictly by happenstance. 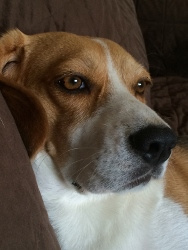 We now enjoy being part of the NJB forum family and your Beagle Meets and can only say thanks again for everything. We came to adopt Belle's last baby girl but then brought Mama Belle home with us and life hasn't been the same since that day. That day was September 8, 2008, and we had just lost our cocker spaniel only nine days earlier to kidney failure. 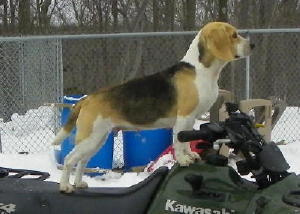 After two cocker spaniels we were ready for a change, a different breed, a "horse of a different color" of a dog, so I was thinking it would be nice to have another beagle, like the one I had while growing up. 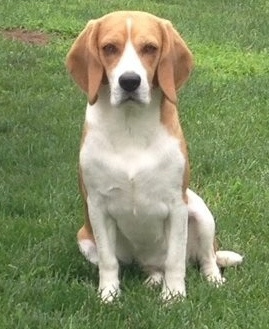 It was on the first Google search that we found New Jersey Beagles and explored the site....David came home and I said, "Honey, can we get a beagle?" He says, "Don't they howl?" I didn't care -- they are so sweet and have such a gentle disposition, always playful, and forever have that child's face. By the way, she doesn't howl at all -- but she does have her way of telling us what she wants! 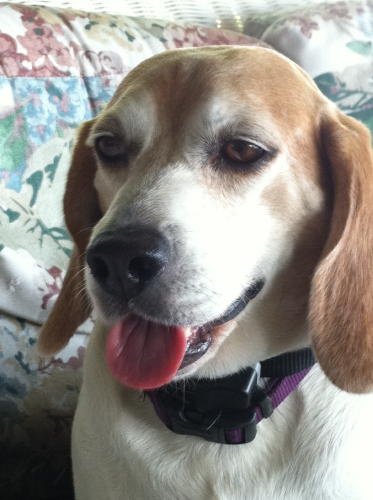 So there she was on the adult beagle page, up for adoption. We arranged for a visit with Terry, actually playing in the yard for over an hour with the whole gang. After a long painstaking period of decision making, it was decided by Daddy that he wanted Miss Belle. She was just perfect; and he was smitten with her, and she with him. We took her home that day to Pennsylvania, where we had lots of adventures in store, many we hadn't even discovered yet. We immediately got her a harness, which I highly recommend, and started walks around the yard and in the neighborhood. It wasn't long until we were taking walks into the woods and under bushes, into places where we really probably shouldn't be going, but she was taking me on an adventure too, to wherever the hound nose took her. We walk for at least an hour a day and we stop by the cleaners (for cookies), the bank (for cookies), wading through the puddles, and by the florist to look at the cat in the window. She loves to go to the country north of here, where we spend a lot of our time in the summer at the cottage. Lots more smells there, bushes, woods -- and a pond!! Dad took care of the house training. She was put on a schedule much like a pup, first thing in the morning and last thing at night before bed, etc. It didn't take too long to get her the idea to do her business outside; after all, all she knew was the kennel. We had to be patient and accentuate the positive, which was really quite easy to do. Well, Dad's relationship with Miss Belle? He is definitely smitten with her -- as soon as he comes home from work in the afternoon Belle runs outside to the gate and the games begin.....romp time!!! These two romp for at least 30 minutes -- hiding from each other, dad making scary sounds and chasing her, keep away games. We don't need kids -- we have Miss Belle!! She's a wonderful dog and we're so lucky to have her. 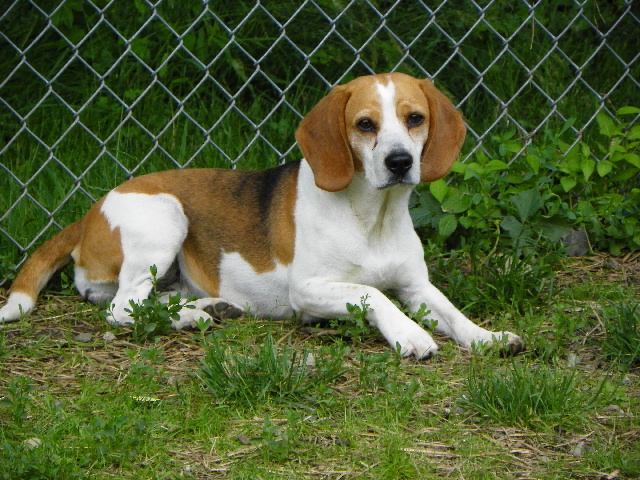 Belle will, however, always have dual citizenship, Pennsylvania -- and the Jersey girl, from NJ Beagles. She lives in Mama Terry's heart and our hearts forever. Many folks along the way have told us that she just wraps you around her heart and stays there. It's true; she's wrapped herself around our heart and we love her very much. 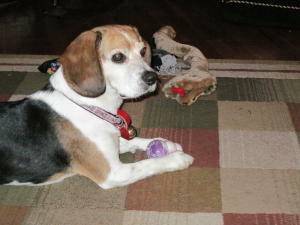 Thank you very much for allowing us to give Miss Belle that forever home! 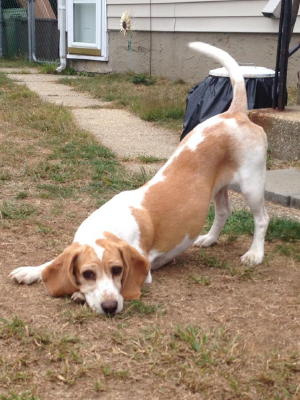 When we first got Sammy, Jerry and I had read on the NJ Beagle website how well Terry’s other adult dogs had done with their new families. We hope this is helpful to anyone else considering adopting one of Terry’s adult dogs. Jerry and I adopted Sammy in early December of 09. Sam was 5 years old. We’ve now had Sammy for almost two month and we can’t believe how well the transition to family pet has gone. He has been such a wonderful addition to our family. 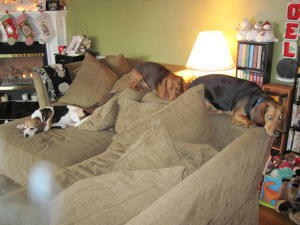 We especially liked the idea of getting an older dog, one that was past the puppy stage. From the very start Sammy has been as friendly as can be; he just loves to be with us. You call his name and he’ll just roll over on his back so you can scratch his belly. The first day we brought Sam home we walked him every hour just to get him used to relieving himself outside. He learned this very quickly and we learned that since he’s not a puppy he can go quite a while before needing to go out again. 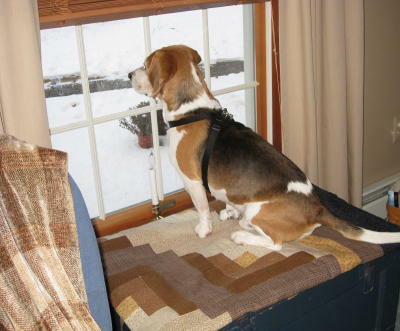 We would like to teach him to ring the bell when he needs to go out, which is what our last beagle did. At this point Sam will sit by the door to let us know it’s time for his walk. On his first day Sam actually went in his crate and sat for a while after checking out the house, I think the crate felt a little like being back at the kennel . We had him sleep in the crate the first few nights, which he didn’t mind at all. Once he felt more comfortable around the house he preferred to be hanging out with the family. What’s nice is Jerry and I are both retired so we are home most of the time, so we rarely use the crate. We are lucky to have a walking park near the house which we visit daily. Sam loves his walks. When at the park he has his nose to the ground and is ready to track all the scents he finds. He walks well on his leash, at first he pulled a bit and now just a little,but we know that’s typical for a beagle. When we first brought Sam home he was a little nervous about the car, but now that he knows we’re going to the park he just jumps right in the back of the station wagon. The park is a nice mile and a half loop and after our walk he usually is asleep in the car before we even get back to the house. The Wantage Dog Park is also nearby. We went once and Sam spent most of his time just marking his territory. After we have Sam fixed, we will be taking him there also. We have Sam on a schedule that’s close to Terry’s and we are feeding him the same food he had at the kennel. We have found this has worked well. We took Sammy to the vet when we first got him and the vet was so impressed with him. He said Terry had done such a wonderful job, the whole office commented on what a good looking dog he was, so healthy and well socialized. We knew Terry had given Sammy such good care and lots of love. We still need to get Sam fixed, the vet said to wait until we had a little more time to bond and after the holidays we could get that done. Jerry and I just love Sammy and are so happy that we adopted him. He’s such a happy pooch. He makes us laugh and we’re all getting lots of exercise. Right now he’s curled up at the window, his favorite spot to be. We feel we are so lucky to be Sammy’s forever homeandto be a part of the NJB family. Thanks Terry! I wanted to send you a letter and tell you what a wonderful time I am having at my forever home. I never thought living inside with people would be so wonderful, but I am loving it! I have my very own human who takes care of me, I spend most of my time with her. Her name is Amanda. I am with her when she is doing her work and when she is relaxing. Everywhere I go, she is right beside me and the best part is she calls me her little girl. I have my own purple bed, but I love to cuddle up with Amanda in her bed at night. There are other members in our family, too, like Candace, Mom and Dad. I have to take turns spending time with them, I don’t want them to feel left out, but there is only so much Powder to go around. There is so much to see, too! Bailey and Harley, the puppies in the house, have been showing me the ropes and, I must say, I am catching on very quickly. Things like going for walks on a leash, learning to sit and stay, and now we are even learning to jump! I have had to teach the puppies a few lessons as well, like we should not be wrestling in the house, and they must learn to use their inside voices! One bark from me and they know who the PRINCESS is. The puppies and I share our toy boxes inside, and they love to play in the snow outside. I would much rather put on my warm sweater and watch from inside though, snow is definitely overrated. My favorite time is right after we go for our walk at night, and we go to the living room. First we will play a bit and then our family settles in with the fireplace going. I cuddle up to someone and fall asleep while they pet me. I really do feel like a princess here in my forever home. See you at the Beagle meet! I know that you've been in touch with my mom about Powder and you just got her little letter. I just wanted to take the time to personally thank you and Pam for allowing us to adopt Powder. Or should I say, letting Powder adopt us. She really is one of the family now. When we first got her I wasn't too sure if I was ready for us to have a third dog in the house. We could finally let Bailey and Harley outside by themselves without fear that they would somehow find a hole big enough to fit through. Then Powder came home and we realized just how small she was. Any hole, big or small, she found it and got through it. The only good thing about her Houdini-like escapes were that when you call her she stops and tries to get back to you. Night time was also pretty bad. We decided that Powder would sleep in my room with me and I had done my research on housetraining an older dog. The books said to leave her in the crate overnight for the first week. Well Miss Powder did not like that one bit. She cried and barked and tried to dig her way out. The only night she actually let me sleep was on Christmas Eve. So I like to think of that as her Christmas present to me. Then we decided to try letting her sleep in the boys' crate (we had a smaller one for her) with the door open. That worked for about five to six nights, at most. In the middle of the night, one night, I was woken up by her little cries. I looked over the side of my bed to see if she was ok and she was standing by my bed wanting to come up. I have my bed on lifts so she couldn't jump up. The very next day we bought her little doggie steps. Now she has officially claimed my bed. I'm sure if you asked her Powder could tell you how to make the bed and where each pillow goes. She's very particular about how the bed is made. If it does not get her sniff of approval we have to make it again. She also likes to hide her toys. If we get them a new toy, or three new toys; one for each, she will take hers and run until she can find somewhere to put it. We've had to take toys off of her so that she stops stressing out over not having the best spot for it. Another thing she has claimed, along with my bed, is my heart. I know that sounds corny but it's so true. I don't know how she did it or when she did it, but that dog and I have grown so close so that she will sleep on me, and I won't mind when my arm or leg looses circulation. She listens so well. At night I'll let her know it's time to come to bed and up the steps she comes. She is such a good dog, you would never know that she was an outside dog for eight years. She still has her diva moments. Especially with the boys, but it's nothing we can't correct. It's funny to watch the boys, who are bigger than her and louder than her, hide from her. When I come home from work at night it's like I can't get to her fast enough. And if I take my time getting in the house she lets me know it. She'll bark to me and jump all over me as if I have been gone for years. With all the transitions that have been going on in my life these past two months it has been great to have my little peanut there. Powder has been great and I truly believe that she had helped to get me through graduation and starting to work. So to sum up, Thank you so much. Bonnie is a wonderful dog and she is adjusting to our family well. she is my cuddle buddy when i read and knit. Cara loves taking her for walks and our weekend routine is to take her to a park for a long walk. Bonnie is a very popular dog with many children when we go to the park. Just about everyone stops to remark on her beautiful coloring and everyone loves how loveable and gentle she is with kids. She loves her new home, likes to play with Cara's toys. I think she just likes being with a family. She sees Brady (Bonnie's son) alot and gets very excited when she hears other dogs in our neighborhood. There is a house next to Karens (Brady's owner) that has about 5 dogs and when the owners let them out Bonnie bays at the living room window like a true pack dog that she is! We adopted Reese on 5/6/12 and it was like he belonged with us immediately. 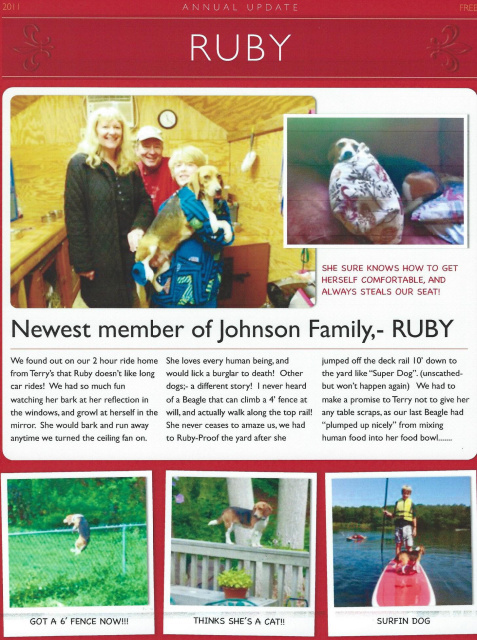 Ruby, our three-year-old beagle girl, had been somewhat subdued after losing her 14-year-old beagle sibling, Freckles, in April. Reese immediately worked his way into hers and our hearts. Reese is always happy and, in fact, seems to always be smiling! I have to say that you can feel Reese coming in our house - he's definitely not light on his feet as we hear things rattling when he enters our family room but that's in part because he always has what we call his "mighty dog" leap of joy whenever he is walking anywhere. It's like he's expecting happiness at every turn. He is working very hard (and so are we) on housebreaking and we are not far from saying he is completely housebroken. He loves his walks through our neighborhood and hopefully doesn't get a big head over all of the comments from passersby about his handsome appearance. While Reese has only been with us a little over three months, I cannot imagine our life without him. We love him to pieces and so does Ruby. We just can't wait to see how he reacts when he sees his other moms at the upcoming beagle meet - I'm sure he's is just going to burst on to the scene in Reese style! Thank you Terry and Pam for giving us the opportunity and privilege to become Reese's parents - we do love him so. While Reese has only been with us a little over three months, I cannot imagine our life without him. We love him to pieces and so does Ruby. We just can't wait to see how he reacts when he sees his other moms at the upcoming beagle meet - I'm sure he is just going to burst on to the scene in Reese style! 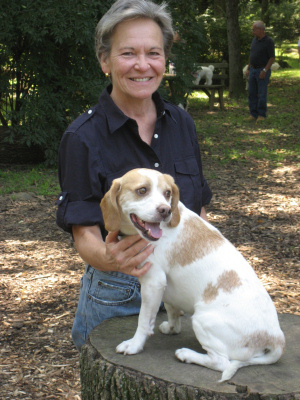 It was July 2011 "Puppy Pick Out Day" at NJ Beagles, when my husband Jeff and I picked out Maggie, one of six pups available from parents Ally and Ricky. Terry usually allows the families to spend some time with the puppies and in our case, Mama Ally was there with her pups. While Jeff was holding Maggie, I went over to see the other pups and Ally. Ally stood up on her hind legs, and put her head on my shoulder. She stayed like that, almost hugging me with her sweet face. I melted right there. I told Jeff on the ride home that if ever Ally goes up for adoption, I would love to adopt her, the sweetest dog I had ever met. We came back to NJ Beagles in August to pick up our little love, Maggie. My daughter Jaime was with me, and we were able to see Ally in the yard along with the others. My feelings hadn't changed about her. Around this time, Terry had mentioned she planned one more litter for Ally. Terry announced in December that she was putting Ally up for adoption. We brought Ally home on February 26, 2012. The first night home, in our bedroom, she slept soundly all night in her crate, alongside her daughter, Maggie, who's crate sits right next to her. Ally was (almost) six years old when she came to us. Our vet reassured us that, although it will be so worth it, this adjustment may take months, not just days or even weeks; and that we must be patient with Ally. Even climbing a flight of stairs to the bedroom was a new learning experience for Ally. But most important, we needed to earn Ally's trust. She was taken away from her kennel (her home) and her kennel mates (her buddies) and from Terry (who she dearly loves and trusts); placed into a house with strangers and not understanding how to tell us she needs to go out to do her business. However, our vet was right; the time and patience it took for her to adjust was so worth it. Ally has fit into our family beautifully and I know now we have earned her trust and her love. Ally is our sweetheart. 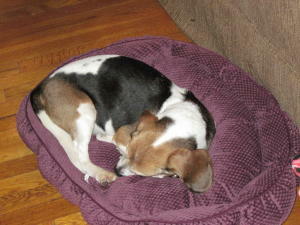 We highly recommend adopting an older dog from NJ Beagles. 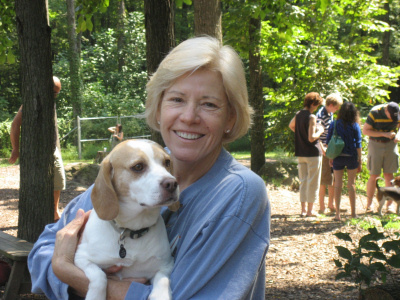 When you meet Terry, you will immediately see and feel the love she holds in her heart for all her puppies and adult dogs. 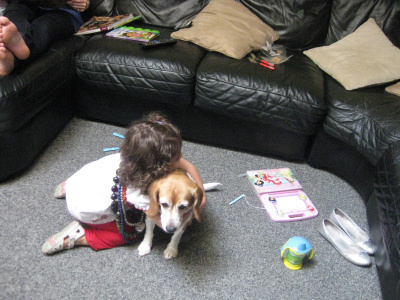 After losing our old beagle, Lucy at the age of 14, we needed the reassurance of knowing our next puppy was coming from a healthy, clean environment where the dogs were very loved. We are grateful to Terry, who has been there for us every step of the way for both Maggie, and then through the adoption process for Ally. 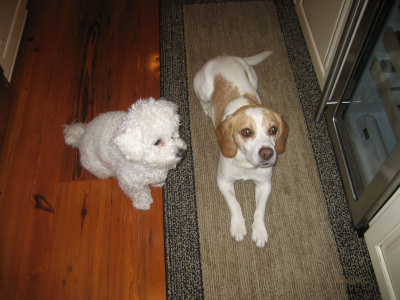 Besides now living with two exceptionally sweet, adorable beagles (mother and daughter), we have also been fortunate enough to meet so many wonderful people who belong to the NJ Beagle family. We chat on the forum, facebook, and meet at the dog park twice a year. A big “Thank You” to Terry for bringing us all together! We first met Josie on Terry’s Ustream site in December 2010 while eagerly awaiting the birth of her puppies. We fell in love with her immediately. We stayed up Christmas Eve into the wee hours of Christmas to watch her deliver. The puppies were beautiful and it didn’t take long for us to make our choice. We picked a beautiful tricolor and named him Hunter. We brought Hunter home in February 2011. As Hunter grew, we decided we wanted a playmate for him and thought of getting an adult dog instead of another puppy. We kept coming back to the idea of adopting Josie and mentioned it a few times to Terry in conversation. In July of 2012, we stopped by Terry’s kennel with Hunter. We spent some time with the kennel dogs and admired Josie’s affection and constant tail wagging. We knew right then and there that Josie would fit in with our family. Terry told us that if we wanted Josie, she was ours, when she was ready for adoption. We were thrilled! We brought Josie home on October 12, 2012. We knew it would be an adjustment for Hunter, Josie and us. She and Hunter became fast friends and have been inseparable. Josie is our little snuggle bug. She loves to sit on your lap or cuddle up right next to you. Josie quickly adapted to the “home life” and enjoys activities such as boating, playing in the yard and attending weekly obedience classes with her son Hunter. We cannot believe it’s only been a year as it feels like she has been with us much longer. Everyone comments how beautiful she is and cannot believe she is 5 years old and not a puppy since she is so playful! Thank you to Terry and Pam for giving us your girl Josie. We love our little escape artist to pieces and yes, that tail still wags constantly!! Last December we were lucky enough to adopt Stella. It was an easy decision, since four years earlier, we had adopted Sam from Terry and Stella is one of Sammy's daughters. 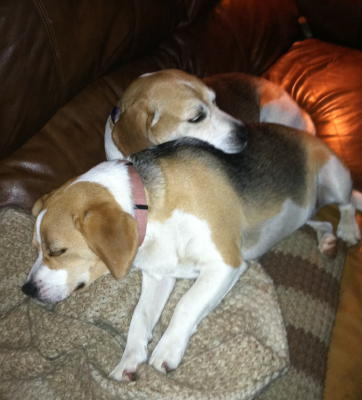 When we first brought Stella home Sammy gave her a warm welcome, he was so happy to have another beagle in the house. Stella's first night, she just curled up with Sam, gave a big sigh and fell sound asleep. Stella loves to be outside, but she wasn't so sure about being inside. She wasn't thrilled with the tv, the ceiling fans or all the Christmas visitors. So we found we needed to give Stella plenty of space and time and lots of hugs and pets to help her feel at home. Over time she became more and more comfortable with her new home. Stella has really settled in, she and Sam are best buddies. Stella is the sweetest little thing, a real cuddler. She has that wonderful NJB temperament, her tail is always up and wagging. When outside her nose is to the ground checking things out. We couldn't be happier that Stunning Stella Delight is now part of our family. 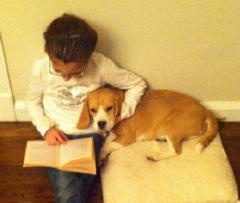 Thank you Terry and Pam for raising such a lovely little beagle and sharing her with us! 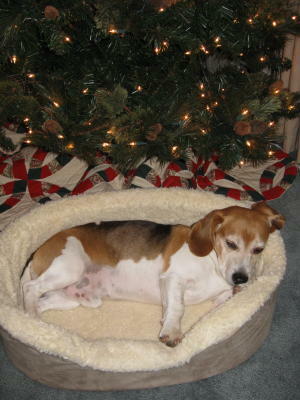 time to get another beagle after our 16 year old beagle had passed away. We first met Cuddles on USTREAM when she was giving birth to puppies. that we would adopt her. sleep, and well cuddle! She certainly lives up to her name. is the best addition to our family. I just wanted to thank you for adding such joy and love to our family. I know that it has been only since April that Ricky has been with us, but it seems as though he's always been here. We are ALL in love. He adjusted quickly to his new home. The kids and he get worn out playing with each other. He has the school schedule down pat and barks and wags his tail at the door. He loves the boys immediately rolls over for belly rubs. He enjoys our walks together and is always happy when his friends come along. We recently went hiking in a state park--wow the smells and bushes. It was a lot of fun for all of us. He is a spoiled but is as much as he spoils us!! I fell in love the moment I saw Dollee. A special feeling, a connection. She was a puppy and she was not available. Driving home, I remember telling my husband that we would wait, as long as needed, and hope that someday Dollee would find her way to us. 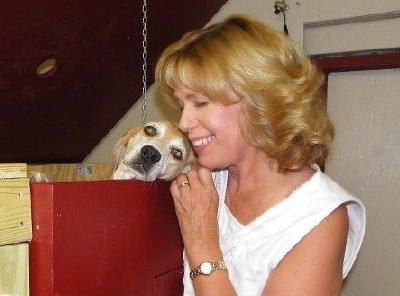 Every time we went to New Jersey Beagles to pick up Chloe (our other NJ Beagle), Dollee would bark at me and I would pet her and say: "Soon Honey, just a bit longer" Terry would laugh and say, "NOPE". Two years later, the day came :) It took some time for her to adapt to her new environment. Lots of love to help her explore and discover her new home and family. She barked at the TV the first couple of times she saw it, and she was fascinated (and still is) by the grill. Dollee is a lucky dog. Very loved. Terry and Pam love her and we love her. She will always be their dog and ours. She is a very special soul. Gentle but firm. She has an incredible personality. She knows what she wants and she can convey it very clearly. She is the most obedient dog I ever had, and I had dogs all my life. First one to come in when called, she eats her food like there is no tomorrow and she is playful like a puppy. Her bark is low and when she does it, it's truly adorable. When it's food time, when she wants to play or when we come home, she barks in a way that melts my heart. She is a calming force for Chloe. They are best friends. They eat, play and sleep together. They spent every minute of the day no farther than a couple of feet from each other. Dollee is specially good with children, in fact, she likes children more than adults. She is patient and can keep them company for long periods of time. Through Audrey's reading and piano practice (my 9 years old daughter), and Lucas' video games and play time (six years old son). She plays fetch and leaves the ball at their feet. Every time we come home, even if we only left for ten minutes, she celebrates. She is happy and makes us so happy. Thank you Terry and Pam for giving us the opportunity to share our lives with her. We are truly blessed for every day we have her. When Maddie and I went to pick-out Leo (from Lucy’s 1st litter) we fell in love with his mother, Lucy in the Sky with Diamonds. She was gentle, sweet and quietly demanding your attention. I told Maddie that day, if Lucy ever comes up for adoption I would like to welcome her as part of our growing Beagle pack. In September 2013, our wishes came true. Lucy became available for adoption and Maddie and I jumped on the opportunity to adopt her. Since that day, she has been a refreshing addition to our home. She is everything we thought she would be and then some. When Lucy came home she initially struggled with everyday sounds of a home. Her adjustment was made easier because Terry voluntarily came to our house several times to help Lucy transition to her new life. Lucy has been a delight in our lives, she has brought comfort and companionship to our other dogs and kids. Lucy is a joy to walk and in fact walks on a leash better than our other 4 dogs. She listens to our commands and comes when asked. She is funny to watch as she plays with the pack and often presides over their antics. To date, she has never had an accident in the house. She is the quiet alpha of the house. She loves her belly rubs and insists that you rub her first thing in the morning. When you rub her belly, she throws her head back reminiscent of a Hollywood fem fatale. When you stop touching her, she gently reminds you by pawing your arm. She has taken ownership of one of the couches—which is now know as “Lucy”s couch”. Often times you find her stretched out while the rest of us are crammed on the other couch. When she sneak on our bed, she enjoys the luxuriously benefit of a Temper-pedic bed. Life is good and Lucy is definitely one of the shining stars in our home. While we are delighted to have Lucy with us, our hearts melt when she is reunited with Terry. At one of the beagle meets upon noticing Terry Lucy leaped over other dogs to get to her. Recently, we took Lucy up to visit Terry and upon entering the kennel again Lucy took off with the pack thrilled to be reunited. Lucy’s reactions to Terry and her kennel home speak volumes as to her care and the level of commitment to her. We are blessed to have Lucy in our lives and look forward to many years of laughter with her.